20 mins drive east of Clevedon. Car Park & Public toilets. Please note this park is only accessible by foot and at low tide. 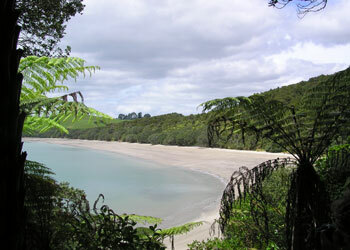 Drive to Kawakawa Bay and follow Bay Coast Road (past boat ramp) to the end. Park at cashmore Bay. Follow signs to Tawhitokino Beach. Tawhitokino, the more north-westerly beach, is a fairly straight and unbroken stretch of sand 1400m long. Taiwawe beach to the south east is about 750 metres long and broken into two parts. Two small streams feed into Tawhitokino, cutting into the bush-clad escarpment behind the beach. The flats that are normally created by stream action are very small. There are no perennial streams running into Taiwawe. The hinterland consists of gently sloping coastal ridges.